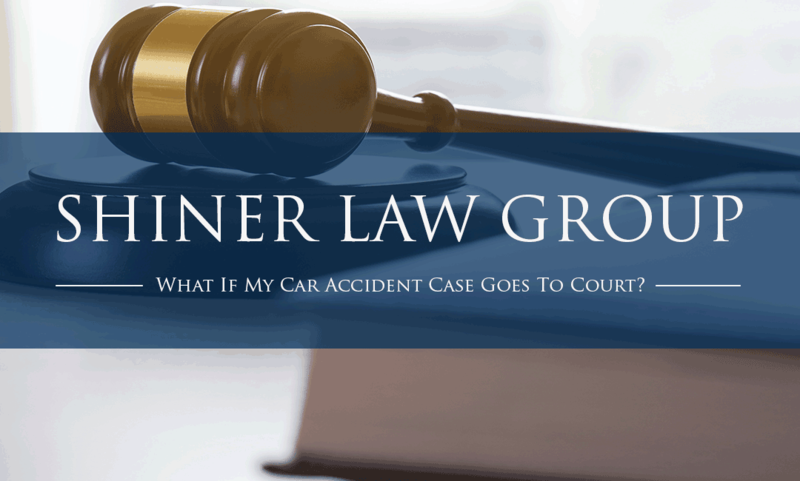 What If My Car Accident Case Goes To Court? People who get injured in an automobile accident and file a personal injury claim often get their claim settled out of court. However, sometimes, when the car accident case is too complicated, personal injury claims end up in court. This may happen when the parties can’t agree on the person who was at fault or when they can’t agree on the amount that must be paid for the injuries. If you suffer an injury and despite all attempts made to resolve the case, you still can’t reach a settlement, you’ll have to take the case to the court. The court process involving personal injury claims brought by car accidents is not too complicated. However, you should become aware of the process to become prepared in case you are ever required attend the court hearings for a personal injury claim. In this post, we’ll enunciate what happens when a car accident goes to court. A trial involves court-based proceedings where the plaintiff and the defendant can present their evidence. The court hears the claims of both parties before they make their final judgment. A car accident can be tried either to a jury or a judge. However, most car accident cases are handled by a jury as oppose to a judge. The first step of the trial involves selecting the jury members who’ll be responsible for overseeing the case. Few questions are asked from potential jurors to ensure that the person doesn’t have any prejudice or biases that can affect their decision. The next stage involves presentation of opening statements. The attorney of the plaintiff mostly goes first as the plaintiff is required to prove the allegations against the defendant. The opening statement carries a lot of weight because it is gives an opportunity to the plaintiff and the defendant to make a strong impression. After the opening statements, both sides will be given the opportunity to provide their evidence to the court. The attorney of the plaintiff again goes first because the plaintiff must prove the allegations. In a personal injury claim, the plaintiff must convince the jury that the car accident occurred because of the negligence of the defendant and therefore the defendant must pay for the injuries sustained by the plaintiff. To proof that the accident occurred because of the defendant’s mistake, the plaintiff’s attorney may present evidence to the court in the form of testimony from witnesses who were present at the scene of the accident or from the plaintiff themselves. The attorney will also provide evidence relating to the injuries and medical treatment of the plaintiff. This evidence may be in the form of medical records, medical bills or and testimony from the medical personnel involved in plaintiff’s treatment. The plaintiff themselves is an important witness because they can testify to the injuries and the cause of the accident. The defendant’s attorney can object to any evidence presented by the plaintiff’s attorney or cross-examine their witnesses and the plaintiff. After the plaintiff’s attorney has presented their evidence, it is the defendant’s turn to do the same. The defendant’s attorney may provide statements of witnesses or medical evidence that is contrary to what was presented by the plaintiff. For example, a defendant’s plaintiff may present evidence that shows that the injuries claimed by the plaintiff didn’t result from the injuries. After both the plaintiff’s and the defendant’s side has presented their evidence to the jury, they can give their closing argument. The opening statements presented in the beginning may explain what evidence will be provided to the jury while the closing statements highlight the evidence presented to the court and the important things that should be noted from the evidence. The closing argument provides an opportunity to both sides to convince the judge that the evidence supports their claims and the verdict should be given in their favor. After both sides have presented their closing argument, the jury will go into a room where they deliberate on all the evidence presented and eventually reach a verdict. In most states, three-quarters of the jury must agree on the decision for it to be considered valid. Once the decision has been reached, the jury will return to the courtroom to notify the judge about their decision. Jury deliberations are confidential and the judge doesn’t observe them. If your car accident case isn’t tried to a jury, then the judge will weigh the evidence presented by both the plaintiff and the defendant and render a decision. The verdict of the jury is read to the parties involved in the case. If the evidence presented by the plaintiff were strong and support the claims they make, then the case will likely go in their favor. However, if the evidence isn’t strong enough to support their claims or the defendant provided more compelling evidence, the plaintiff will lose the case and thereby lose the compensation they may or may not have deserved. If you are filing a personal injury lawsuit against someone, you should hire a personal injury lawyer to represent you at the court. Although you can file a personal injury case without a lawyer, doing so will put you at a major disadvantage. The reason is that you may not be aware of the law related to personal injuries or you may not be able to gather sufficient evidence to prove your claim. It is therefore best to hire an experienced personal injury attorney to represent you at the court. An attorney will collect all the evidence related to the accident and talk to witnesses on your behalf to strengthen your case and ensure that you get the compensation you deserve.